Peeping Tom (1960) – Film Review – Film. Politics. Pop Culture. Peeping Tom is a great film as its main character guides us hand-in-hand through his atrocities, a self-conscious first-person technique that creates mountains of tension. As the audience, we’re peeping into Mark Boehl’s life and his strange hobby and obsession with recording people at the cusp of their being victimized by him. The story is pieced together in a literary form in the way that everything we learn of, like the mothers blindness for example, has a cause and an importance later on. The director, Michael Powell, establishes the time and place very well, almost like a stage-film in which highly-decorative scenes remain static for long periods of time; the layout of the apartment, the ground-floor, the secluded bunk-like upstairs where Mark dwells and develops his celluloid. Films that are constantly jump-cutting to new places can be uncomfortable to watch; to better understand the character is by their environment, and with a character like Mark, who keeps to himself, it can be troublesome when trying to probe why he does what he does. And essentially, without the necessary information we need to understand him, all we have is the performance of Karlheinz Böhm to attempt to make us feel some tangible form of sympathy for the man. The film is a dense, unforgettable character study. Mark Boehl is an obsessive 8mm film recorder. He works for a film company, not yet achieving his goal of becoming a director, and lives a quiet and methodical life, doing photo-shoots for women on the side. When he becomes interested in a woman who lives next door, his secrets begin to unravel, and he must choose between his hobby and the girl he now has come to enjoy; to say, “who he’s come to love” would be unfitting for Marks character, because he’s the sort of person who proclaims that he ‘enjoys your presence’, nothing more, nothing less. 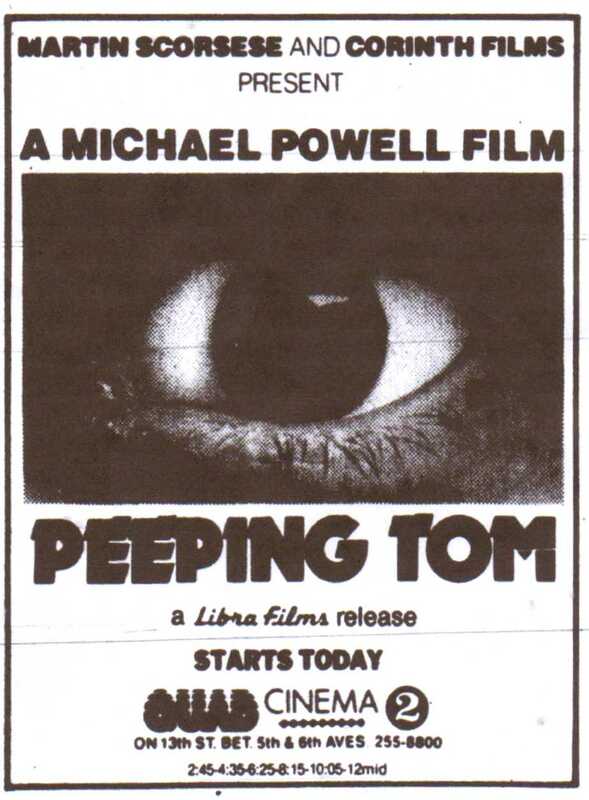 Peeping Tom didn’t do wonders for director Michael Powell’s film career, as its reception was similar to the reaction Kubrick received following the release of A Clockwork Orange. But thanks to Martin Scorsese’s restoration of the film, Powell-fans can see and admire the voyeuristic work of the director even more.